You might like to try Regular Rings 1 before having a go at this challenge. Below is a picture of an unfolded piece of paper. 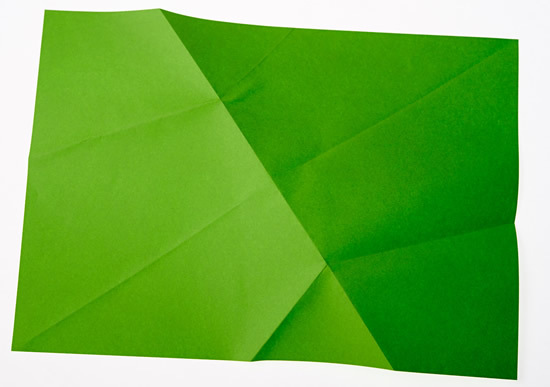 Can you work out what shape is made when it’s folded up using the crease pattern shown? Click below if you want to see the shape. 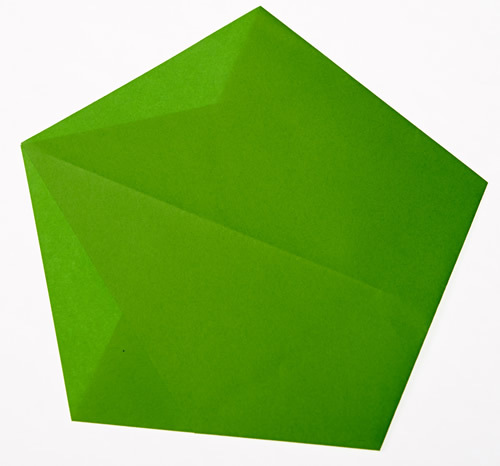 Can you make one of these shapes with a new piece of paper? Now make several of the same shape from A4, A5 and A6 pieces of paper in two contrasting colours. Take a large and small shape made from your first colour and a medium shape made from your second colour. You must be able to see at least part of each shape. All three shapes must fit inside the perimeter (outline) of the largest shape. Use a new large, medium and small shape to recreate the same pattern but in opposite colours from Challenge 1. Place these two patterns next to each other and continue to fold and add to your pattern until you’ve made a ring. Can you predict how many of your original Challenge 1 pattern you will need? We would love to see photos of the ring you make. Regular polygons and circles. Practical Activity. 2D shapes and their properties. Working systematically. Visualising. Interactivities. Cubes & cuboids. Tangram. Compound transformations. Generalising.